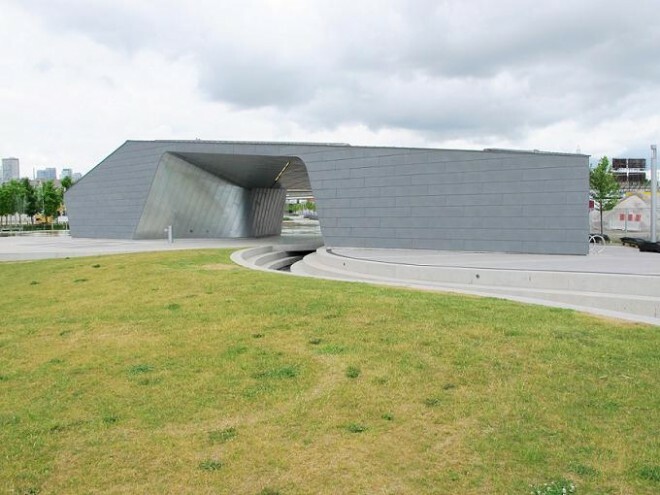 On a recent trip to Toronto, I visited Sherbourne Common, a waterfront park designed by Phillips Farevaag Smallenberg. Walking around the park, you could be forgiven for thinking that you were actually passing through an elite museum's pristine sculpture garden. Everything is placed just so, in a way that has created an environment so totally uninviting and ignorant of how human beings want to use public space that I knew, within moments of arriving, that what I was seeing was undoubtedly an "award-winning" design. 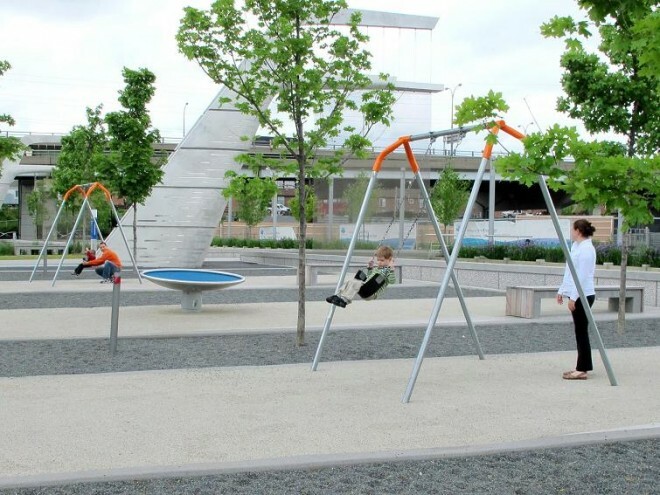 Indeed, Sherbourne Common received a National Honor Award from the Canadian Society of Landscape Architects—Canada's highest honor for landscape design—earlier this year. Something is desperately wrong with a system in which a place like Sherbourne Common is deemed worthy of this kind of adulation. This is a place where pieces of play equipment are separated by vast stretches of grass and pavement, siloing different modes of play and neutralizing their capacity for sparking children’s imaginations. Watching the handful of youngsters that were there trying to play on aimless gravel strips and concrete steps was almost painful. Imagine if you will a single swing poised, absurdly, alone; yards away, across swaths of pebbles and stone, some "sculptural" play equipment; and harried parents trying to keep track of their children as they dart between these far-flung art pieces. The paths are broken up by erratically placed hedges and canals, creating unnecessary barriers. A wall of plantings provides a thorough green-wash, serving some insignificant, supposedly ecological purpose to hide the fact that the space itself is a failure at creating a joyful ecology of human activity. An “urban beach” area—something that has been done beautifully in cities like New York, Paris, Rotterdam, and Berlin—is also a missed opportunity here, falling with a dull thud thanks to overdesign. The contrast with Dufferin Grove Park, another stop on this trip (and many trips before), is breathtaking. 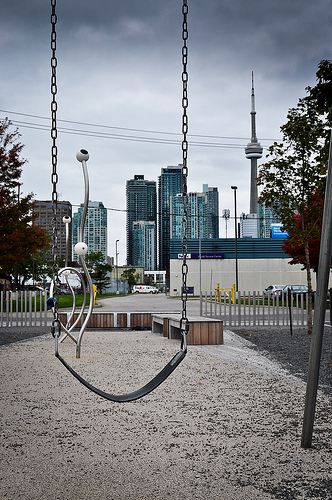 Dufferin features a mix of activities and types of spaces: quiet groves, bustling playgrounds, campfires, a farmer's market, and one of the most amazing sand pits you'll find anywhere. 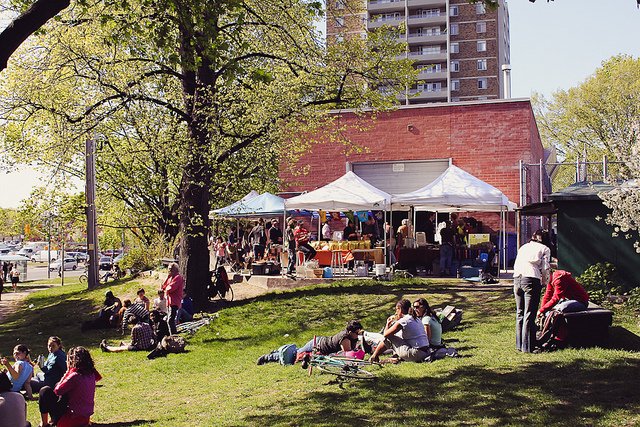 Unlike the visitors to Sherbourne Common, most of whom looked confused or simply lost, the people in Dufferin Grove were beaming. It's one of the best places I've ever been, no question. Dufferin Grove Park, of course, has not won any major design awards. It is not designed, in the sense that we think of that word today; but it is highly cultivated. So much thought has gone into questions like "How do people want to use this space?" and "How can visitors to the park be involved in its continuing development?" 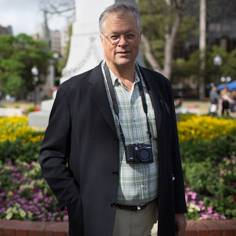 The park's managers have gone to great lengths to make sure that their public space is welcoming and inspiring to the broadest range of people possible: young to old, quiet to rambunctious. The design professions have been given free reign to set up a wholly dysfunctional system when it comes time to promote the best and brightest, and the results are devastating our public spaces. Competition and awards juries are comprised of peers, people who have been "properly educated" to discern good design from bad. Whether the jury members actually have to use the spaces that they praise is irrelevant. They are tastemakers, not Placemakers. As a result, so much of design today is geared toward pleasing juries of peers, rather than the people who actually determine whether a new space will become a great place: the ones who meet there, play there, and live their lives there. Bragging rights come from superlatives and high LEED ratings (which, by now, should be more a source of shame for architects who don't achieve them rather than pride for those who do), rather than community life. And let's not get caught up on issues of style! Too often, attempts to start a meaningful discussion about the failure of so much of contemporary design to serve people are sidelined by architects' and designers' claims that what's really happening is the attacking of “good design” and contemporary aesthetics by the uninitiated. That is not the case. Aesthetics are subjective, but use is not. The primary question that should be asked, when determining the success of a public space, is: are people using it? Are they happy, and smiling? Do they brag about how much they love it (not how many awards it’s won) to their friends in other cities? This is the real tragedy of design today: it is so rarefied that it alienates everyday citizens and perpetuates the myth that architecture and planning are not things that they should be concerned with. Communities do not think "we need to talk to a designer" when they want a new park; they talk to each other, and to their elected officials. Architects, landscape architects, and urban planners come later (if ever), and would benefit enormously from increased public interest in what they do. Involving people in shaping public spaces not only benefits those individuals and their neighborhoods through the development of social capital, it benefits designers by making what they do an integral part of a sacred community process instead of an expensive "extra." Designers have a great deal of knowledge that is infinitely more resonant when it is used to help everyday citizens articulate their needs and create public spaces that are responsive to the communities they serve. I'm issuing a call to arms to designers who are tired of the current system and are ready to begin building our professions back into communities. This is a great time to grow the constituency for design by creating places that people can really use. If you know of an "award-winning" public space that needs a reality check, please share it in the comments below. I want to call out places like Sherbourne Common and offer constructive, place-centered criticism more often here on the Placemaking Blog. I'll be sharing my thoughts on the plan for Brooklyn Bridge Park's Pier 6 next.